whole Cashew Nuts 5 no. First clean chicken pieces and then take it in a bowl, and add all other ingredients for Marination, mix well and keep aside. Wash rice and soak it in enough water and keep aside. Grind all the "wet Ingredients" to a smooth paste with little water and keep ready. Now Heat oil & ghee in a pressure cooker or quart pan, when it is hot add bay leaf, cardamom, maratti mokku, star anise and fry well. Then add sliced pearl onions and saute for 1-2 minutes. After that add ground paste and saute until the raw smell leaves in medium heat. Then add chopped tomato and saute for a minute and add the marinated chicken, chilli powder, coriander powder, turmeric powder and saute for 5-6 minutes. And then add 1 cup coconut milk and 3 cups water, enough salt, handful of chopped mint and cilantro, stir well and bring it to boil. Once it starts boiling add the soaked and drained rice and cook in medium high heat. When the rice starts boiling with chicken gravy, turn the heat to low-medium and close the pan or cooker with lid and cook for 1 whistle and wait till the pressure cools down. If cooking in open pot, cook till rice is done. Once done fluff the rice with slotted spatula or fork. 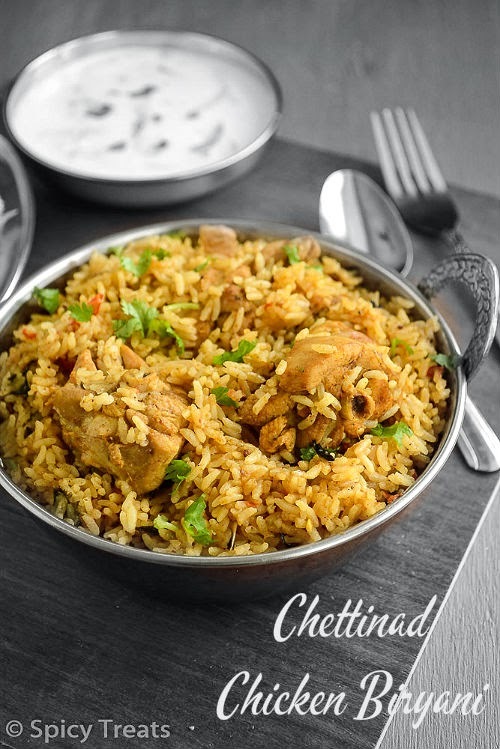 That's it..Spicy and Flavorful Chettinad Chicken Biryani ready. Serve Hot with Raita and omelette. 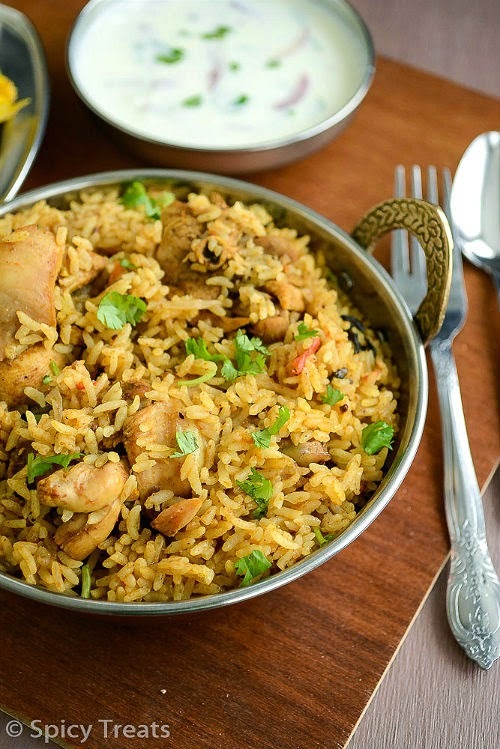 Try to use Seeraga Samba rice if not available then use Basmati rice. With Basmati rice the taste and flavor may vary but still it will taste good. Also use pearl onion/sambar onions for the authentic taste. I used 1/2 cup shredded coconut to make coconut milk. For even more rich taste you can use about 2 cups coconut milk and 2 cups water to cook 2 cups of rice. I use 4 cups of water/liquid to cook 2 cups of water and i soak the rice for minimum 20 minutes. I bought Seeraga Saala Rice in Patel Brothers, Devon Ave, Chicago. 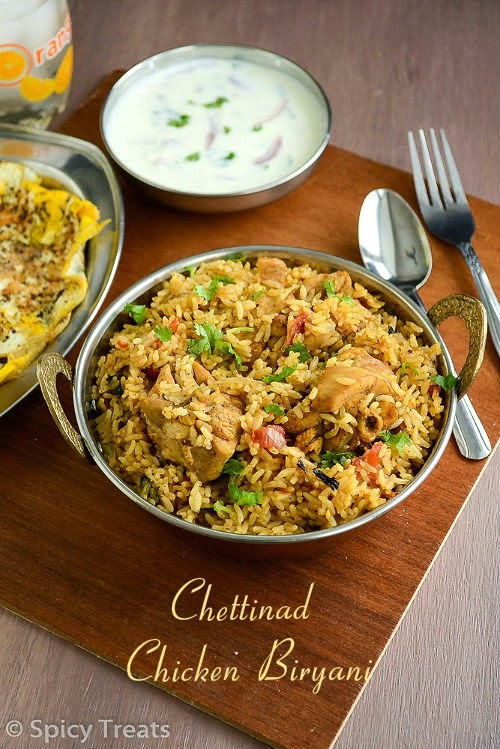 biriyani looks yummy ...seeraga samba rice looks perfect . 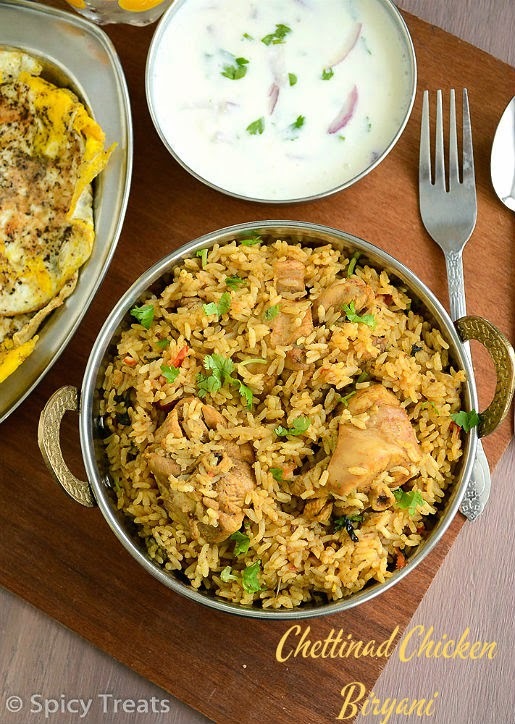 My mouth is watering here, delicious briyani..
drooling ..perfect for weekends ..
looks delish.. definitely a must try recipe.. Wanted to confirm if cilantro used is coriander seeds or leaves used.. It is a spice, that is specially added for biryani...If it is not available for you, then you can skip it.